This is a really exciting project we had to share with our readers! The bloggers of Darkstreet are almost all located in Denver and the Crypto scene in Denver is very vibrant. On top of a variety of Crypto and Blockchain projects there are also projects in the Blockchain Art space including VRUot. 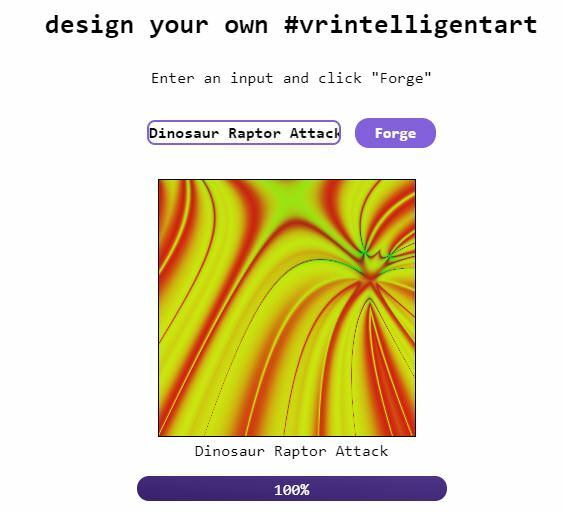 VRUot has a method of creating art based off of inputs you type into the system. 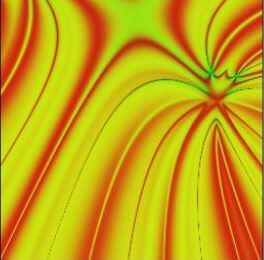 It then turns those word inputs into art through the use of special mathematical algorithms. This Forge image can be uploaded to the blockchain of Bitmark. Allowing a user to create art and collect it on a blockchain. VRUot describes this type of art as "VRIntelligent Art" and describes it as "autonomous image creation system based on abstract mathematics." This cool process of making art through math VRUot calls forging. Forging is easy, fun and just generally cool. You can type in words, phrases, numbers and watch as they turn into art before your eyes. Then if you like the art you can store it onto the Bitmark blockchain. That is right there is a blockchain aspect to this technology too. The VRUot system also is tied to the Bitmark blockchain which is a blockchain that can be used to store property rights, digital assets and data. 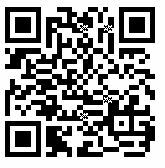 The site also has the ability to look at the bitmark blockchain to find your record of the art once it is on there. The abstract pieces of art that can be created vary wildly. You can see some of the art pieces on the twitter of VRUot. Alright so those look fun, lets see what we can do ourselves. We decided to try our hands at this. We played with a few words here and there. First we tried using the word "Darkstreet". 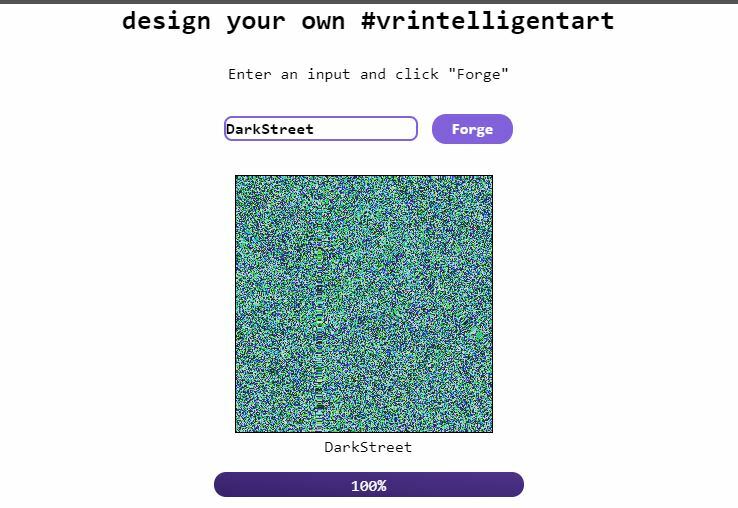 So we entered Darkstreet then forged a greenish blue piece of algorimthic art. We then decided lets beam this up to the blockchain. Here is another one I did off of DarkstreetKatey. You can see that by just adding one word to the input the output has varied wildly from the other. Here was our personal favorite piece of Forged art. Dinosaur Raptor Attack. What can I say I was watching Jurassic Park so yeah. You can see from all of these pictures depending on what is added in the input what comes out from the Forge can vary wildly. Once you have a piece of art you like you can then load it up on the Bitmark blockchain. 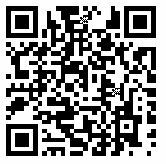 You save it, then upload it up on to the blockchain using options directly below where you forge the art. 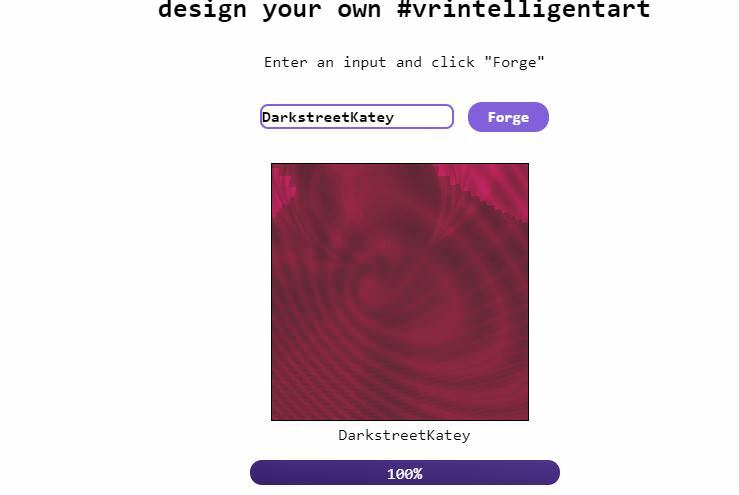 Another feature built into the project is the use of IFTT applicaitons to automatically forge pieces of art based off words entered in various applications. I have not tried this part of it out but we will explore this in the future. The whole process is very easy and quite fun. I actually think this would also double as a fun tool for teacher to use to explain the blockchain to students. 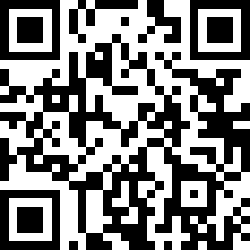 The price is right.....its free and its very fun. Perhaps the most interesting part of this project is the potential places it can go. The project is also connected to an AI application Tensorflow and into VR through Decentraland. It seems that the project in the future could be used by both. This makes the project into a fun nexus of a variety of bleeding edge technologies. This article is lot of informations to get. You got my attention in this and I wanna thank you for that. It will increase my interest when it comes to cryptocurrency. I also search one of the cryptocurrency related, a decentralize one called Dapp.com. Did you know this thing? I have a brief information to you. Dapp.com is the largest dedicated platform for sharing exciting dapps and valuable knowledge about decentralized technology. They help everyone understand, create, and enjoy this exciting new technology with enthusiasm. They have so many giveaways and now they are handling Imperial Throne and Yummies. Imperial Throne for giveaways and Yummies for giving home😊.